"We see a lot of estate jewelry that comes up in our line of business," Hirsch explained to Business Insider. "People who are selling their parents' estate assume the money is in the house itself - but sometimes the things inside the home have a lot more value than they think." For jewelry you inherit or find at garage sales, it's best to do a few simple DIY tests before bringing the pieces in for a gemologist to look at. 1. Look at the diamond and setting through a loupe. A loupe is a magnifying glass that you can buy at any jewelry store and will let you take a closer look at your gem and setting. "When you're looking at a diamond, there are a few things you'll notice," Hirsch told us. "First, the majority of diamonds are made in nature so that means you're going to see some imperfections in the carbon. A fake stone would be perfect - absolutely perfect." Hirsch cautions that certain lab-grown stones will also look perfect through the loupe, and so you should be cautious before discarding perfect gems. It can be a clue, however, to take a closer look or bring the stone to an expert. Second, observe the diamond's edges. "When you're taking a look at a diamond through a loupe, a real stone is going to have sharp edges, and a fake stone will have rounded edges," Hirsch explained. Lastly, look at the mounting and etchings, especially any marks that signify what metal was used. "If the metal is gold plated or silver, chances are it's not a diamond because why would you put a nice stone mounted in such a cheap metal?" Hirsch said. "Most diamonds are mounted in gold or set in platinum." "Also take a look at the mounting itself and how that diamond is set," she added. "If the setting looks like it's of poor quality, that probably means it's not going to be a real diamond either." 2. Rub sandpaper against the stone. This is an easy test since diamonds are one of the world's hardest materials and won't be scratched by the rough surface. "If it's a diamond, it will remain perfect, if it's a cubic zirconium, it will scratch it up," Hirsch said. 3. Do the fog test. Breathe hot air on your diamond the same way you would if you were fogging up a bathroom mirror. "A fake diamond will fog up for a short period of time whereas a real diamond will not because it won't retain the heat," Hirsch explained. 4. Hold it in the light to see how it sparkles. 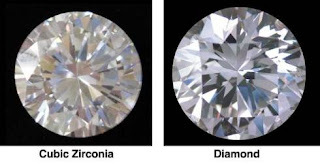 The way that diamonds reflect light is unique: Inside the stone, the diamond will sparkle gray and white (known as "brilliance") while outside of the gem, it will reflect rainbow colors onto other surfaces (this dispersed light is known as "fire"). A fake diamond will have rainbow colors that you can see inside the diamond. "People have a misconception that diamonds sparkle like a rainbow, but they don't," Hirsch said. "They do sparkle, but it's more of a gray color. If you see something with rainbow colors [inside the stone], it could be a sign that it's not a diamond." 5. Look at the stone's refractivity. Diamonds are so sparkly because of the way they refract and bend light. Glass, quartz, and cubic zirconium may mimic a diamond's brilliance, but they have much lower refractive indexes. This means that if your stone isn't in a setting, you can place it over a newspaper and the light will scatter inside the real diamond and prevent a black reflection. A fake diamond will let the black shine through, and you may even be able to read a word depending on the size of the fake stone. If your diamond is mounted, make sure you can't see through it to the mount itself - that's a very bad sign. Once you've done all your home tests, it's time to take your jewels that could be diamonds to a gemologist. "You don't want to take a box full of jewelry because it will cost you money for them to look," Hirsch explained. "I would be flat out frank and say you're not interested in selling, but just ask if they're worth you paying attention to or if it's fine to let the kid's play with them." But don't just take your diamonds to any old jeweler. It's important to do your research and find a qualified gemologist. "At mall stores, they tend to have sales people - not gemologists," Hirsch said. "They just know what sells in their stores and what appeals to the masses. Look beyond the average jewelry store and go to a local antique stores or ask your local antique jewelry store who is a reputable gemologist in town who knows about diamonds. here are 4 factors to determine the purity of Diamonds- the 4Cs. 1. Carat: The carat is the weight of the diamond .. Large Diamonds are very rare and costly. 2. Clarity: Clarity differs for each diamonds. This is noted on a scale ranging from F to I. The less the defect (or more the clarity), the more the cost of the diamond. Clarity actually refers to the internal and external imperfections of the diamond (How clear It is ). FL or IF - Flawless or Internally Flawless - meaning that it is perfect. SI-1 and SI-2, which means that the diamond is slightly imperfect. 4. Cut: Only an expert cutter can create the radiance or brilliance of the diamonds. The internal reflections in the faces of the diamond will radiate out to the outer faces. This is the brilliance in a diamond. The cuts can vary in shapes from an oval, pear, or round.and so on. Fog test- Real diamonds clear away quickly when exposed to fog .If the diamond you have just fogged is taking a bit longer to shed off its fog, then it must be a fake. Put the diamond in water. If it is real it will sink, and if it is fake it will float in water. After purchasing a diamond, take it to another jeweler for appraisal.